I recently wrote about effective uses of technology in the classroom. This past week our group of teaching librarians has been using another technology that was also really successful. We are teaching information literacy in about 30 sections of CORE 110 classes which is an interdisciplinary first year class called Concepts of the Self. In the class, students are trying to understand the self and why they behave the way they do through examining various texts and literature. In this IL session we are looking at similar concepts in the context of information. We’re asking students to examine their own information seeking behaviors, habits and preferences. One way we’re doing this is by asking them questions using Poll Everywhere. 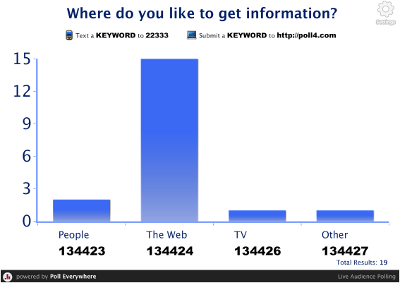 The questions are about they prefer to get information, share information and search. Poll Everywhere is a web based technology that allows participants to vote in polls via text message, a web page, an embeddable widget, and even Twitter. The polls can be multiple choice, free response, or donation polls where people pledge money. It’s a technology that almost every student already has in their pocket – Purchasing clickers would not have been feasible for us due to the large number of sections we have to teach and because we have to go to a wide variety of different classrooms. Instead we are using a technology that students are comfortable with and use all the time. Everyone has a little bit of an ego – Students love seeing themselves reflected on the large screen. It gives people a sense of control and people appreciate when they are asked for their opinion. It’s not simply someone telling them what to think. It creates room for discussion – Students have to commit to a choice and then as a teacher you can give them an opportunity to justify or explain that choice and see how others might differ from them. It’s real time – The students got really excited when they saw the graphs move and change as their answers come in. It adds a bit of a wow factor. It’s novel – Most students haven’t used something like this and we catch them off guard. Librarians asking them to pull out their phones and vote with them can break down some stereotypes that first-years might have. For it to work seamlessly, my colleague Sarah and I had to set up the polls and put them into PowerPoint presentations for the rest of the teaching librarians. It was kind of a large experiment (30+ sections is a lot) and it could have failed bigtime. But luckily our library and our crew of teaching librarians are a pretty adventurous bunch. We don’t mind experimenting and in this instance it paid off. I think the free text response would work great for brainstorming keywords or other brainstorming sessions. I saw examples of this at a conference at Dartmouth a couple of weeks ago and it seemed to work, though they did warn against students going overboard with anonymous text. One student wrote “my roommate is a playa.” I thought it was pretty funny, but you could see how it could have the possibility to get out of control. But I think that’s the exception, and with a small group I’d imagine it would work well. I think it would also work well for really large classes too. At least the multiple choice option. It would be an active, engaging way of getting audience participation. Nice. Our IT department also bought this, and I was always itching to try it out, but was worried that users wouldn’t bother to sms & use up one of their quota of free text messages. That was a concern for us too. We don’t require that they participate, but I think a lot of students have unlimited text plans or at least have enough texts that two or three might not be a big deal. For the most part, students have been enjoying it and participating. What were you thinking of using it for? Not a problem. It’s a really cool technology and we’re considering using it more and purchasing a subscription. What would be the best option in our situation? We have 4-5 teachers and we teach 30+ sections between us. With this version we had to copy the poll 30 times and then upload them into 30 sets of powerpoint slides, but I’d imagine there has to be an easier way with one of the paid accounts. Hmm. Maybe the lesser of $50/teacher/year ($250) or the school-wide at $2.50/student/year. Both allow you to run a single poll multiple times (clearing in-between), and still have access to your previous sets of results (they are archived). Would you be willing to share your questions? I’m interested in the kinds of prompts you give them. We had students explain their answers and it ended up generating a lot of discussion. I hope this helps! I like quick polls to test student learning. This could be very helpful to get students involved. At my time in Harshman Magnet Middle School, my biology would use this particular website to prepare us for Benchmarks, which are sort of like mid-way tests to track our progress.I thought it was pretty cool especially since if you didnt have a phone, you could go online and answer the poll, rather it was a free response or a multiple choice. I rather liked pollev.com Thumbs up by me!